Determining what Jack wanted to be for Halloween this year was much more complicated than the actual construction of the costume (although for an easy costume, there was a lot of busy work). 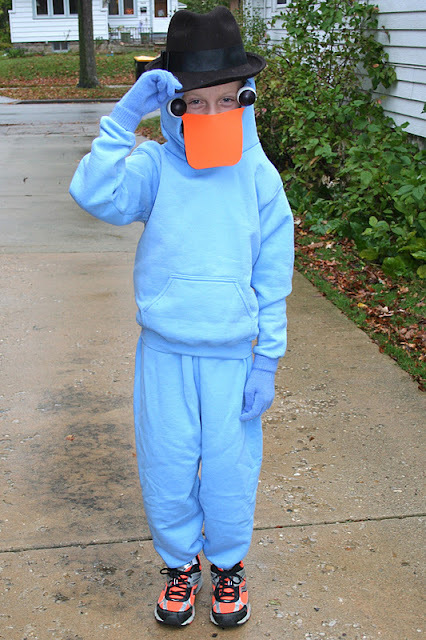 He finally decided on Agent P, AKA Perry the Platypus when he transforms into his secret agent persona (click here to see him in cartoon form). We did some searching and got the inspiration for Jack's costume here at Dabbled. 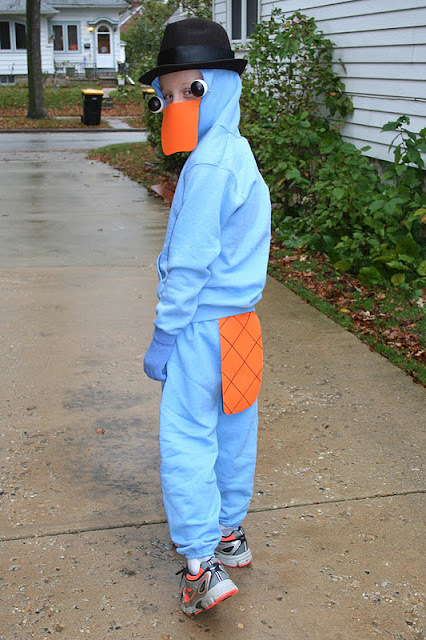 I love that it will be a warm costume, that it's easy to wear (kickball ready is important around here), and that it's cute in an 8-year-old boy kind of way (in other words, not super too cutesy). Best of all, he'll have a new set of sweats after Halloween as everything is detachable! Fedora - I removed the crazy feathers from the side and the brown ribbon, then attached 1 1/2" black grosgrain ribbon with hot glue. Eyes - Matt punctured ping pong balls with large safety pins and attached them to the front of the sweatshirt hood near Jack's eyes. I used Sharpie to make the black eyes on the ping pong balls. Bill - I free-handed a bill shape on the craft foam sheet and cut it out with scissors. We tried a few different ways to attach the bill (using a foam visor, string) but ended up hot gluing small pieces of ribbon to the inside of the bill and then attaching them with small safety pins to the inside of the sweatshirt hood. There is no bottom portion to the bill which makes it easier for Jack to breathe. Tail - Again, I free-handed a tail shape on the craft foam sheet and cut it out with scissors. Using a straight-edge and a black Sharpie, I made the criss-cross pattern on both sides. The tail is attached with large safety pins to the top of the sweatpants (which are hidden by the sweatshirt). Love this costume. It is just perfect in so many ways.